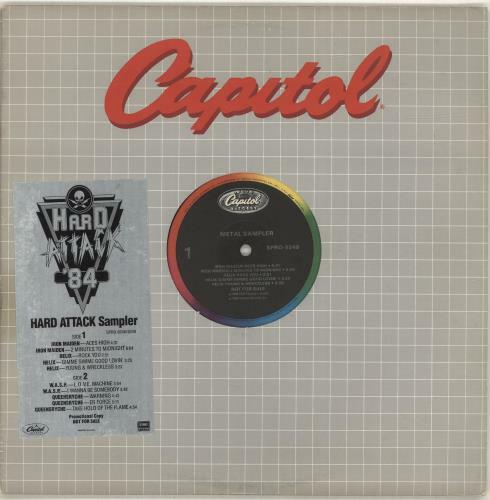 IRON MAIDEN / VARIOUS Hard Attack Sampler (1984 US promotional-only 10-track vinyl LP sampler, opening with Aces High [4:31] & 2 Minutes To Midnight [6:04] by Iron Maiden, also including material from Helix, W.A.S.P. & Queensr�che, with customlabel design & die-cut company sleeve with silver hype sticker. The sleeve shows very little of its age & the vinyl appears Excellent with few signs of play SPRO-9248/9).